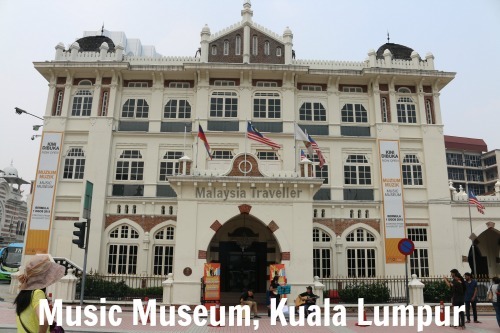 Music Museum Kuala Lumpur opened on 1st August 2015 in an old colonial-era building on Jalan Raja facing Dataran Merdeka in the heart of Kuala Lumpur. When I visited the area again in October 2017 the museum appeared to have closed down. Permanently? Not sure. It seems this location continues to be unlucky for its occupants. The building has had a number of uses since Chartered bank moved out, first as the National History Museum, then, more recently, a restaurant before becoming the Music Museum. Exhibits are arranged on the ground floor of the building in what was once the banking hall. 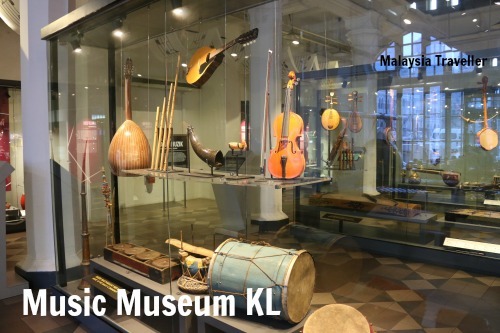 Mostly they are displays of various musical instruments, showcasing the music of the Malays, Chinese, Indians and the indigenous communities of Sarawak and Sabah. Traditional musical ensembles such as the gamelan are featured as well as an explanation of nobat, an Arab music genre which became popular in the royal courts of Malaya in the 13th century. 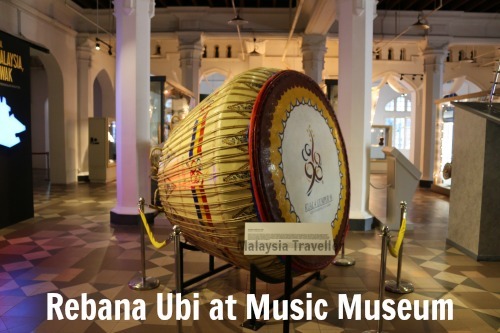 An eye-catching centrepiece is a replica of the rebana ubi, a huge colourfully decorated drum which was used at the opening ceremony of the XVI Commonwealth Games in Kuala Lumpur in 1998. 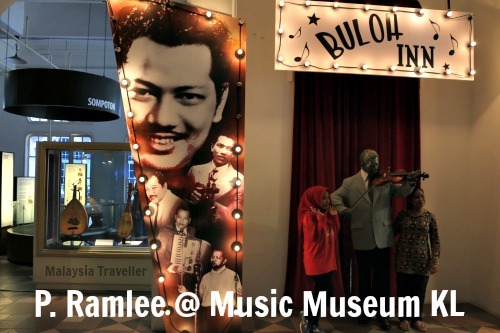 One display is dedicated to P. Ramlee (1929-1973), who was probably Malaysia’s most popular singer, actor, director, musician and songwriter. His restful tones play in the background giving the museum a nostalgic atmosphere. There is not a huge amount to see here. Even if you read every information board word-for-word it will only take you ten minutes or so to see it all. Having said that the exhibits are interesting enough and nicely displayed. It’s air-conditioned, with relaxing background music and it’s free so why wouldn’t you want to go inside and take a look? Besides, you get the chance to see inside this classic heritage building. The museum is open daily from 9am to 5pm. The Museum is located right next door to the Kuala Lumpur City Gallery. I have marked the exact location on the map on my Top KL Attractions page. To see a full list of nearby hotels at discounted rates click on the Agoda advertisement below.